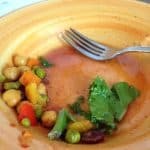 Moroccan Chickpea Stew. The. Best. Flavor. Slow cooker recipe. Simple. Easy. Amazing. Moroccan Chickpea Stew. Flavorful. 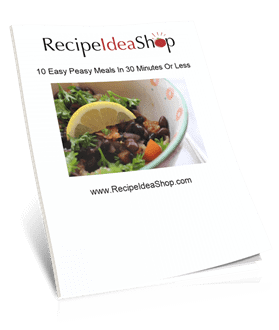 Delicious slow cooker recipe. Hi. It’s Lois in the kitchen. 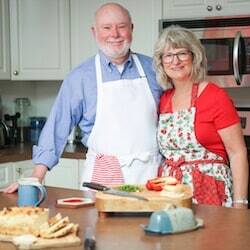 I love trying new recipes and bringing them to community dinners to share. This Moroccan Chickpea Stew is an amazing dish people appreciate. So flavorful and packed with goodness. Because there are several ingredients, it does take about 15 minutes to get it ready to cook, but it is well worth the effort! 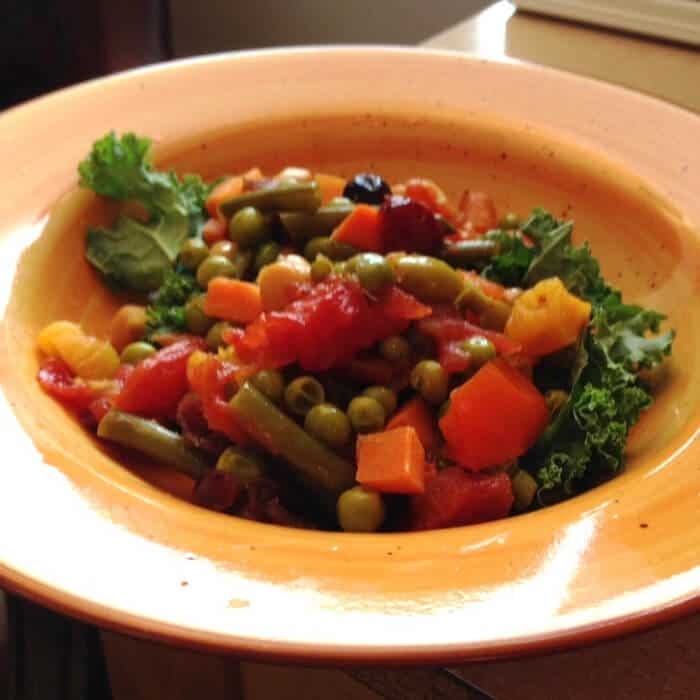 The recipe is originally from Robin Robertson’s Fresh From the Vegetarian Slow Cooker. This was so delicious, as all of her recipes are! Everyone who tried it loved it, and the smell of it was very enticing. I served it over fresh raw kale, and that was the perfect finish. It is vegan, vegetarian, gluten-free, and dairy-free, so just about anyone can eat it. Moroccan Chickpea Stew served over raw kale. I know this is a slow cooker recipe, and y’all probably have one, but have you tried the Instant Pot? OMG. You can use it as a slow cooker, pressure cooker, rice cooker, sauté pot, and so much more. You could easily convert this recipe to Instant Pot! Really. Don’t wait. Get one. Instant Pot DUO60 6 Qt 7-in-1 Multi-Use Programmable Pressure Cooker, Slow Cooker, Rice Cooker, Steamer, Sauté, Yogurt Maker and Warmer. Buy it today on Amazon! Heat the oil in a large skilled. Sauté the shallots, garlic and spices for about 2 minutes over medium heat. Add the red peppers and carrots and sauté for about 5-7 minutes. Dump all this into a 4 to 6 quart crock pot (slow cooker). Add the beans, lemon juice, chick peas, tomatoes and vegetable stock and cook either on low for 6 hours or on high for 3 hours (I did it on high). About 1/2 hour before serving, add the dried fruit, peas and olives. 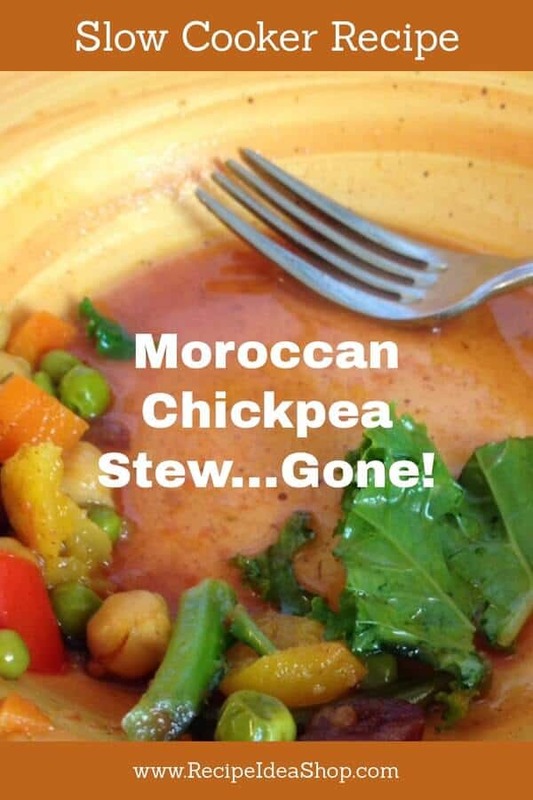 Moroccan Chickpea Stew Nutrition Label. Each serving is about 2 cups. Recipe serves 8.